Straight hair, waves, curls – on women’s heads you can find a variety of hair types, but why exactly? Why does one woman have the hair straight as strings, while the other one is busy managing a mane of curly hair? The appearance of our hair, as well as many other features that we have, is a matter of genes. They are responsible for arrangement of various bonds (eg. hydrogen or ion) which determine the shape of a hair. The very hair growth begins in the hair follicle, in the part called the hair bulb. There the living cells multiply, die, and only then emerge to the surface. That is why cutting hair is painless while plucking is nowhere near pleasant. 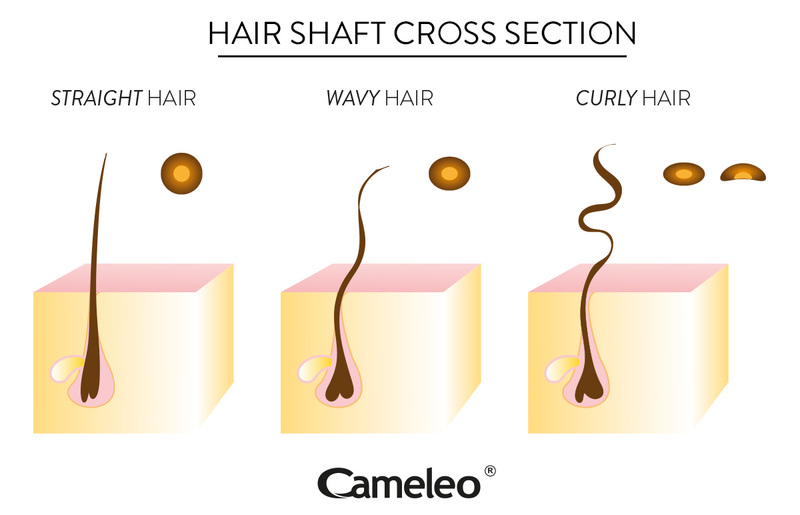 The difference between straight and curly hair begins at the follicle level: the shape of the bulb differs between people and determines the shape of their hair. The “curved” bulbs produce asymmetrical layers, which results in wavy and curly hair. The section of a hair is also different. People with straight hair have round fibers while those with curly hair more oval-shaped. It often seems to us that people with curls have a lot of hair that is also strong and dense. Nothing could be more wrong. 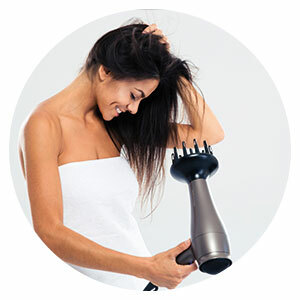 Because of its unusual structure, curly hair is much softer and more vulnerable to external factors than straight hair. The places where the hair curls are thinner and thus more prone to breaking. In addition, curly hair is often deficient in sebum. This is due to the fact that it does not adhere to the scalp as firmly as straight hair and is thus more dry and dull. Too oily hair? That is a problem that rarely affects curly hair, but there are other, equally annoying, problems. So how can you manage your curly crown? Tying the hair into a tight ponytail and hiding them from the world is always a way out, but it would be better to show a little patience and provide your hair with proper everyday care. Well-maintained curls are a real treasure which many women dream of. Let’s start with your hair-do. The choice of a becoming one is the key to success. Short cut will surely find its followers, but you will achieve the best styling effects with long and medium-length hair. You can also consider a layered cut to give your hair an extra shape. Washing curly hair also requires a lot of attention. We have already mentioned above that curly hair has a very delicate structure, so always remember to massage the hair care products into your hair very gently. The same applies to towel-drying. We say no to rubbing! The temperature of the water is equally important. We know how nice the hot shower can be, but your hair will be forever grateful to you if you use lukewarm or even cool water. It closes the hair cuticles which gives your hair beautiful shine and smoothness. Always remember to comb your curly hair while it is still wet, after applying conditioner. If you comb it dry, you risk an unnecessary damage and unwanted frizz effect. Say goodbye also to brushes and fine tooth combs. Use a wide tooth comb, or just split the curls with your fingers. It would be best to let your hair dry naturally. If you are running out of time, however, use a dryer with diffuser attachment, which will not disturb the curl pattern or cause frizz. The cool air will additionally shut down the hair cuticles. That is the core of curly hair care. Curly hair is usually very dry, so you should pay special attention is its hydration. Shampoo is not enough for proper hair care and satisfying results. The regular use of conditioner and mask which contain natural moisturizers like argan oil, will make the hair soft and shiny. It is worth choosing the lines specially designed for curly hair. Such products contain ingredients that prevent frizzing and emphasize the curl. One of such lines is our Cameleo BB for curly and wavy hair. These professional hair care products provide you with the maximum care at a friendly price. 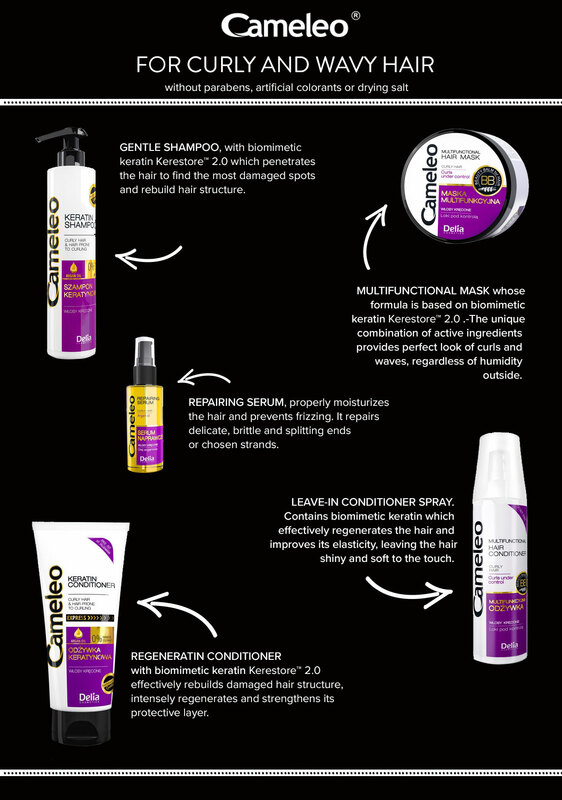 Cameleo for curly and wavy hair line consists of shampoo, leave-in conditioner, rinse-out conditioner spray, mask and repairing serum. Shampoos and conditioners do not contain parabens, artificial colorants or salt. All products are rich in regenerating keratin, which effectively rebuilds even the most damaged hair. There is no denying that people with curly hair have to put a lot of effort into hair care . History shows us, however. that it is worth investing a little time. After all, lots of famous people wore or wear curls with pride. Marilyn, Coco, Grace Kelly, Madonna and Beyonce prove that neat ringlets and sensual waves are the essence of a beautiful look.